Almost overnight, the massive military-industrial assets of the Soviet Union came under the jurisdiction of fifteen states instead of one established government. While only four states inherited weapons of mass destruction, most of the fifteen states of the former Soviet Union can produce sensitive materials and equipment. Because all the states serve as transit points for both legal commerce and illegal smuggling, developing export control systems in all the newly independent states (NIS) has become the cornerstone of the global effort to reduce the risk of proliferation of weapons of mass destruction. 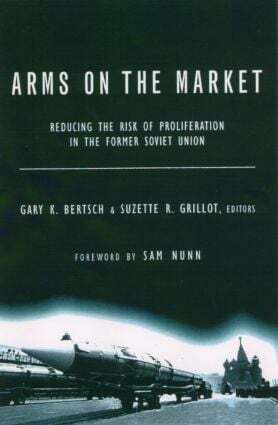 Arms on the Market is the first book to tackle this difficult subject. Not only does it explore the various theoretical approaches that help us understand the development of export control systems in the nis, but it also introduces a unique method for measuring and comparing export control development. Gary Bertsch is the University Professor of Political Science and Director of the Center for International Trade and Security at the University of Georgia. He is co-author of U.S. and Japanese Nonproliferation Export Controls (1996) and International Cooperation on Nonproliferation Export Controls (1994). Suzette Grillot is Assistant Director and Senior Research Associate, also at CITS, University of Georgia.